This is the last day of the Thanksgiving weekend here is the US. If you're a person who celebrates the day, I hope you had a beautiful one! Before I begin to go back to my semi-regular schedule of cutting, sewing and blogging, I'd like to point you toward yesterday's post on my other blog. When I returned to blogging post-Sandy, I mentioned the minor discomforts my DH and I endured during our few days without electricity or heat. Though it's been about a month since Sandy hit, there are so many who are still struggling in the aftermath. I'd like to help, and I'm asking for your help too. Though Crafting Fashion's focus is on sewing, I know that some of you have an interest in other crafts. For those of you who haven't clicked on that link yet, here's a brief appeal: If you happen to have need of green sparkly yarn, (It is the holiday season after all.) I know just where you can get your hands on some. From me! I'll be donating 100% of proceeds from the sale of my green sparkly yarn to a wonderful organization that mobilizes volunteers and supplies support services to those in need. The organization is called New York Cares. Please read my blog post to see how you can purchase this yarn or learn how to make a direct donation. You could even win a prize! 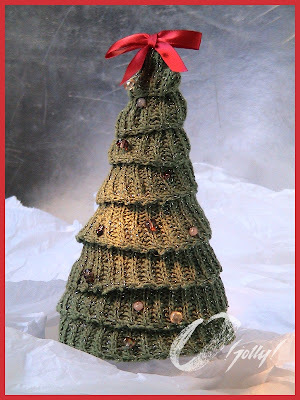 Here's the Christmas tree I knitted last year with the green sparkly yarn. Tomorrow I get back to get back to cutting and sewing and all the fun stuff that goes with it.